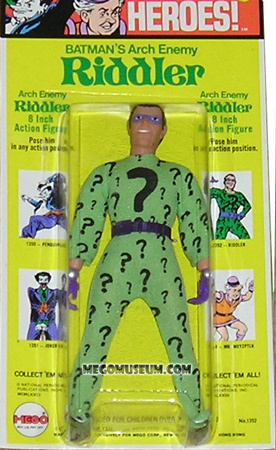 Riddler first appeared in the 1974 Superfoes wave of figures which comprised of 3/4 Bat Villains. 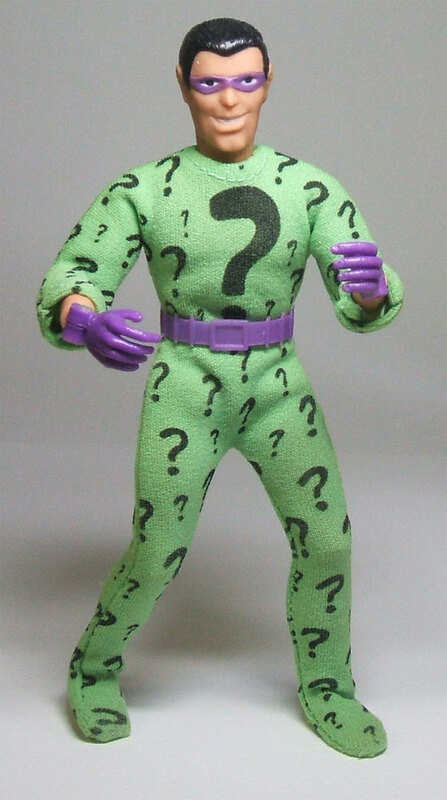 The character was something of a bit player in the comics until Frank Gorshin’s maniacal performance on the 60’s TV show elevated the Riddler’s profile. the Superfoes got colored hands actually) and his belt is a more purple Batman utility belt. 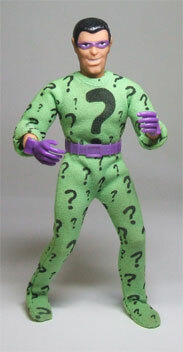 The Riddler head sculpt captures the characters look perfectly, next to the Joker he may be the best of the Superfoes. 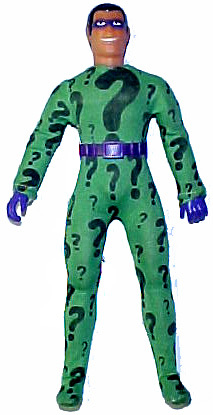 Riddler remained in the WGSH until 1979 when he was dropped from the assortment, the figure was available on both type 1 and type 2 bodies. 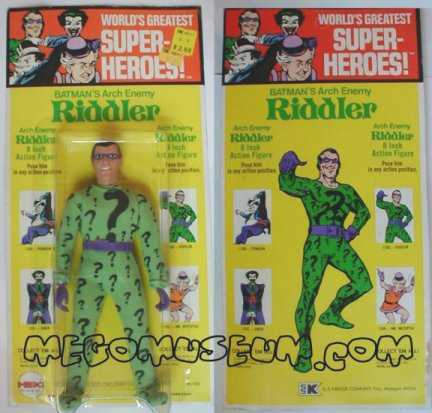 Mego included Riddler in the 1974 Bend N Flex line as well. 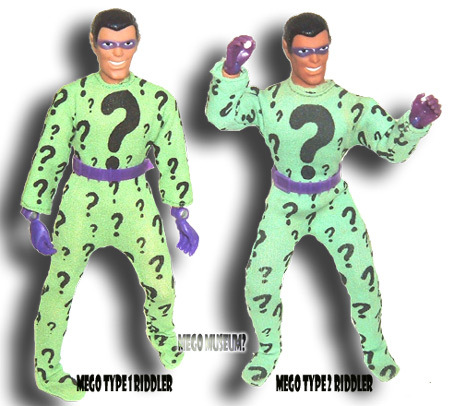 Mego Type one and Type 2 Riddler. The type one figure tends to have an issue with the suit bagging up at the bottom. in the 1974 catalog) are extremely rare. pack in the selection. 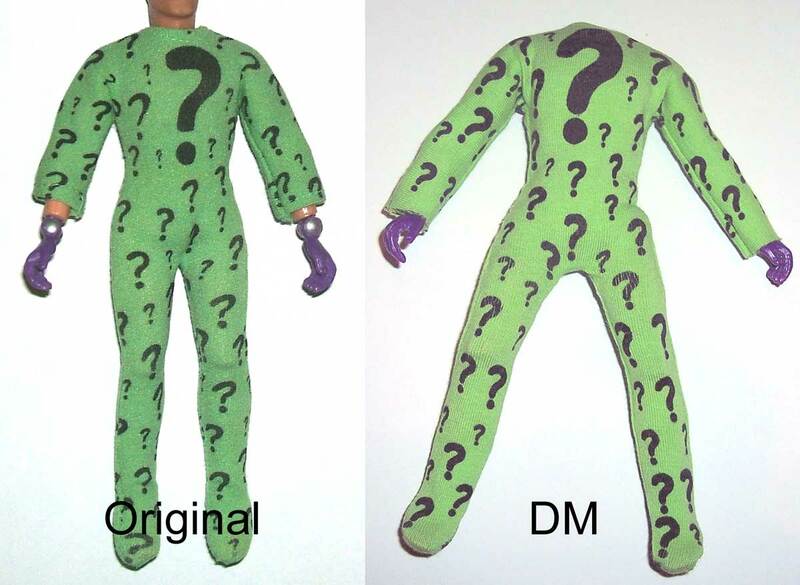 Both type 1 and type 2 Riddlers come in window boxes. Collection of Scott C Adams. 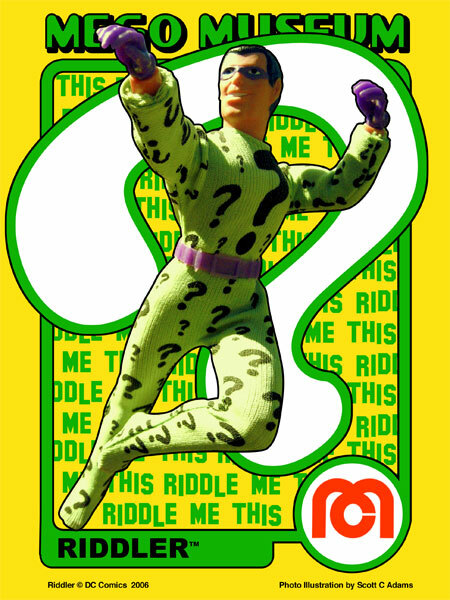 Very rare 1976 Riddler card. 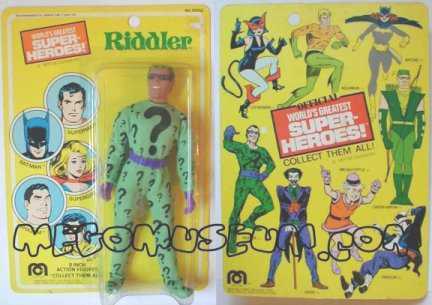 Like Green Arrow and Catwoman, the Riddler was short packed and underproduced, making carded examples (76 or 77) rare and pricey. Collection of Scott C. Adams, photo by Benjamin Holcomb, World’s Greatest Toys. 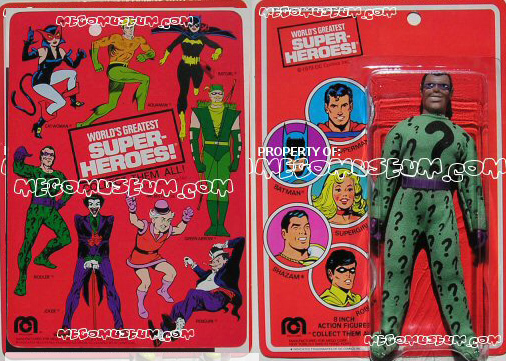 Red Card Mego Riddler shown above, red cards seem to be a way of getting rid of excess inventory of certain characters. 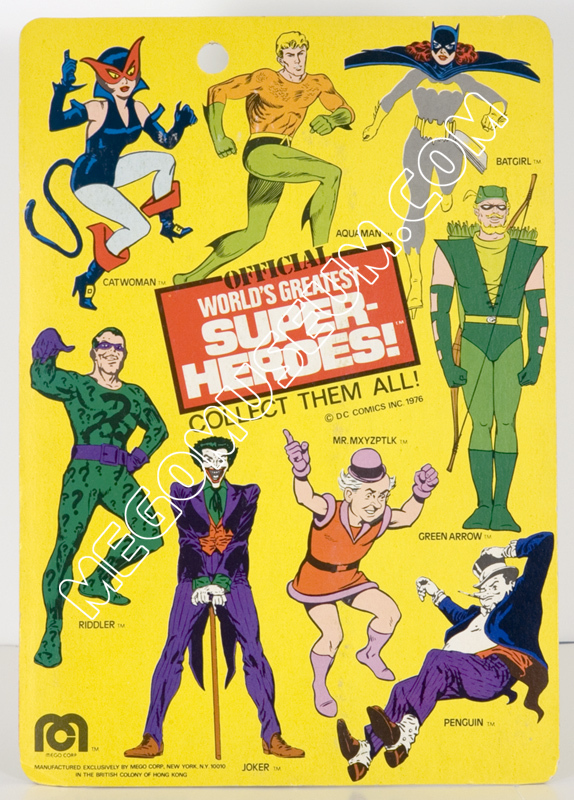 It makes sense that the characters found on red cards such as Aquaman and Green Arrow were also removed from the WGSH in 1979. 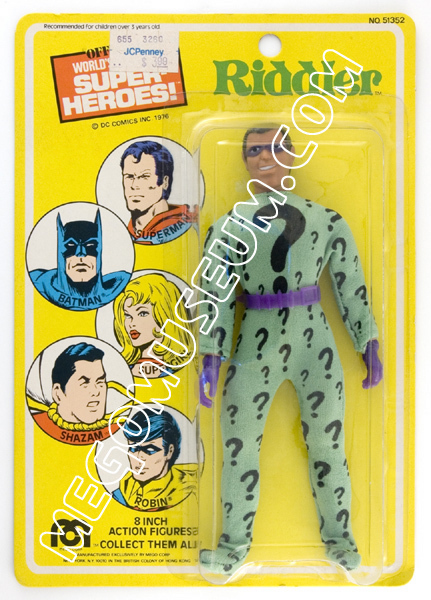 Extremely rare Toltoys (Australia) Fist Fighting Riddler. For more information on the Fist Fighters see their exhibit page! 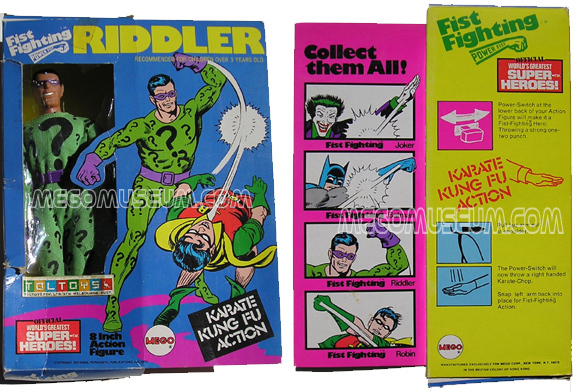 This Boxed Fist Fighting Riddler provided by IMP The Fist Fighters was a brief attempt to add a gimmick to the WGSH line, it received more fanfare in foreign markets. 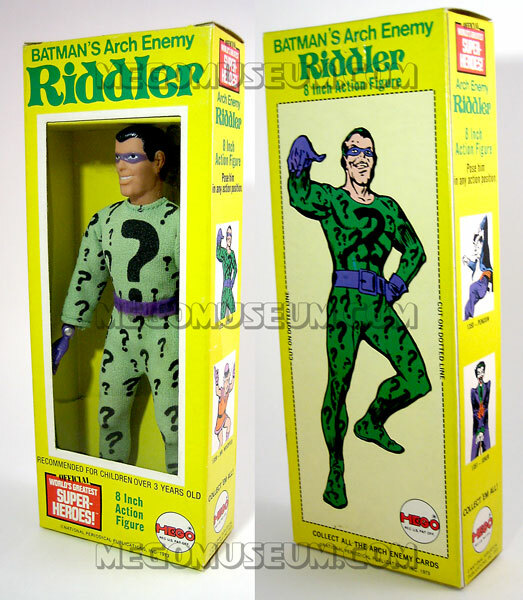 This particular Riddler used to belong to Glen Danzig, of DANZIG fame! It’s been confirmed that Curt Swan drew the Fist Fighter box art. Classic. 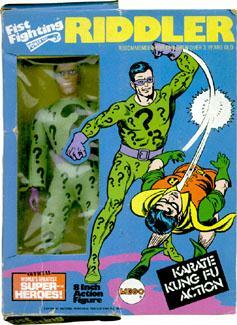 In Mexico, the Riddler is called Acerjito and Lili Ledy made this cool looking fist fighting version. Courtesy of Palitoy’s Foreign Mego Archive. 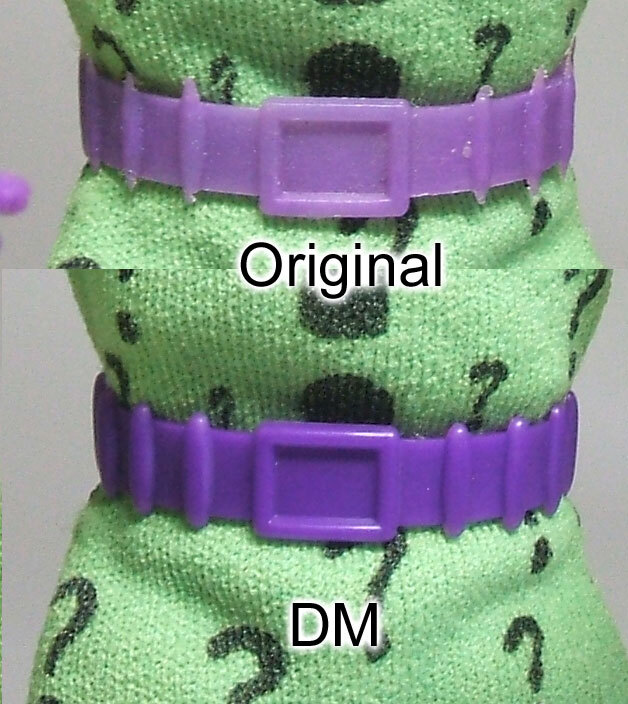 Riddler sports a purple version of the Batman belt. Doc Mego produced the only known factory made reproduction and it is very close to the original version, although the tips of the “points” are a little more rounded, and it’s a darker purple. It is stamped DM on the back of the buckle. 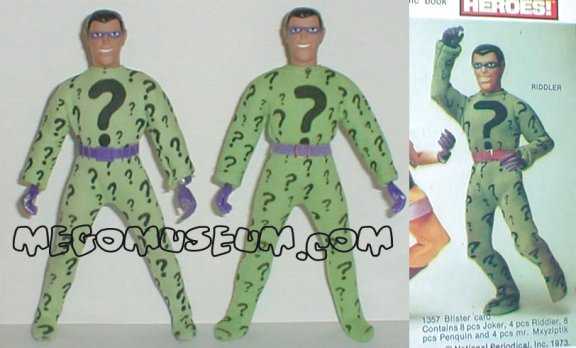 Riddler’s suit has been factory reproduced by Doctor Mego, and pretty accurately. The material is a bit slicker and the sleeves have an unhemmed look. It is unmarked.